Director Geoff Ritchie’s first attempt to set afoot the game of re-tuning Sherlock Holmes as the protagonist of an action-buddy movie proved entertaining but unworthy of the Great Detective, an impression unchanged after a second viewing and the benefit of time. The effort to draw on previously marginalized aspects of the character, though interesting, presented a confused vision that indulged the worst tendencies of Hollywood spectacles: much loudness, little substance. Despite the undeniable chemistry of the film’s leads, Robert Downey Jr. and Jude Law, and an attractive production, the film delivered not a compelling revision but an exaggerated blockbuster confection filled with overtorqued action, overcooked humour, and a plot better suited to an episode of Scooby Doo. That it was nevertheless more entertaining than it deserved to be speaks to how well-made the film was; the problem rested in translating Ritchie’s vision of the character into a faithful script. Picking up where the first film left off, with Moriarty coming out of the shadows to become Holmes’ direct antagonist, A Game of Shadows achieves the successful tuning Ritchie aims for. In part, that success is due to Jared Harris’ marvelous interpretation of Moriarty, a seemingly innocuous college professor who conveys a malicious criminal intelligence not through bombast but through softly spoken words. But the bulk of the credit goes to the script by Kieran Mulroney and Michele Mulroney, which successfully achieves in tone and balance what the previous film, written by Michael Robert Johnson, Anthony Peckham and Simon Kinberg, could only hint at. 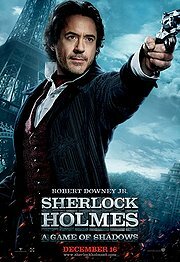 Action supplements rather than overwhelms intellect in this film, and genuine drama underlines the comical elements, resulting in a Sherlock Holmes we can credibly accept as both master detective and action hero, along with a Watson who is both an eminently worthy comrade-in-arms and a good bloke in his own right. The thrilling, high-stakes cat-and-mouse plot delivers on the intense struggle between two equal but opposing minds, while delivering fun little moments highlighting the enduring, though somewhat chafing, friendship between Holmes and Watson. A genuine and all-to-rare pleasure is how women in the film aren’t relegated to the status of distressed damsels, but are courageous, clever, and valuable participants in the narrative. Noomi Rapace, who memorably played Lisbeth Salander in the Swedish film adaptation of Stieg Larsson’s Millenium trilogy, plays a gypsy who, despite being relegated to a supporting role, nonetheless commands attention and displays a fierce streak of womanly independence that demonstrates that “supporting” need not be “subordinate.” Also refreshing is Watson’ wife Mary, smartly played by Kelly Reilly and presented as a sharp who stands her own ground. A valuable player as Holmes works the game against Moriarty, she is not given the thankless task of fretting over her husband, but allowed to contribute in the intellectual effort to defeat the criminal mastermind. Where the trend in Hollywood is to demonstrate gender parity by presenting women capable of violence equal to that of men, Ritchie and his screenwriters here offer a more functional equivalence. All in all, a superior effort…and a far more convincing perspective on the Great Detective than even Steven Moffat could achieve in his ill-conceived 21st Century Sherlock Holmes series, Sherlock. While I agree generally with your observations, I confess to have fallen asleep during part of this film, so maybe I'm not the best to judge. But I heartily agree regarding the current TV version. Much as I like Benedict Cumberbatch, the stories seem uninspired and weirdly de-natured. Villains these days cannot just be villains, they have to possess almost supernatural powers. For me, there is sufficient horror in the death of one person. Antagonists don't all have to be serial killers and superhuman terrorists. Agreed. It's the problem of escalation; a murder isn't shocking, so we have to have a mass murderer. Saving a city isn't enough, so we have to save the world. Dr. Who, which Sherlock's Steven Moffat also runs, is especially guilty of this sort of exaggeration. So far, the universe has been threatened twice, time itself put at risk of being ended, and if that's not enough, all of "reality" was jeopardized. It's silly! But back to Sherlock. The show suffers most, in my view, from the flawed premise that Sherlock Holmes is a sensible character for the 21st century. It seems to me that what makes the character special is precisely the fact that his forensic science method was ahead of its time in Victorian England. Today, however, Sherlock's methods pervade criminology and thus don't stand out. Hence, contemporary detectives who rely on psychology and other elements of detection to solve crimes.